One of India's most famous cities, Agra is home to the breathtaking white-marble Taj Mahal, a truly magnificent Mughal riverside mausoleum and World Heritage Site. Agra lies in the state of Uttar Pradesh, in North India, and this region is home to no less than three designated World Heritage Sites, also including the neighbouring ghost city of Fatehpur Sikri and the red-sandstone Agra Fort. 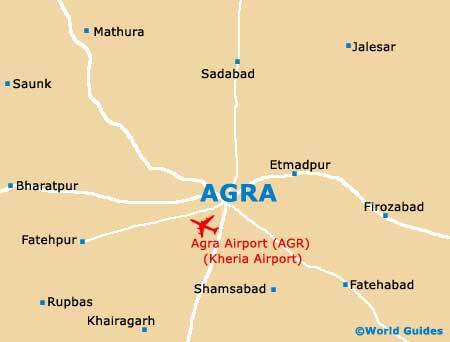 As well as being a major Indian tourist destination, Agra is also a spreading industrial city and stands just over 200 km / 124 miles to the south of Delhi, being within easy reach by train. Agra was established as the Mughal capital in 1526 and is known for its chaotic and vibrant marketplace (chowk), endless auto rickshaw touts, plentiful souvenir vendors, historic temples and many grand, ancient monuments and tombs. For tourist information in Agra, do try to avoid unofficial tourist guides and travel agencies. 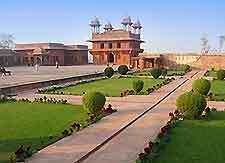 Recommended in the Foreigners' Regional Registration Office along the Fatehpur Sikri Road, the UP Tourism Office at the Agra Cantonment Train Station, and also Agra's India Tourism Office, which is located at the mall and features tourist information not only about Agra, but India-wide. Although many tourists choose to visit Agra as a day trip from New Delhi, there is really much more to see here that is possible in just one day. Especially popular in the Agra area are desert camel rides, the exciting 6-D Adlabs Cinema complex, the white-marble Moti Masjid (Pearl Mosque), and the magnificent Bageshwarnath Temple, located next to the Raja Ki Mandi Railway Station. Also worth visiting in Agra is Akbar's Mausoleum, which boasts three-storey minarets and many inquisitive, resident monkeys and brightly coloured parakeets. 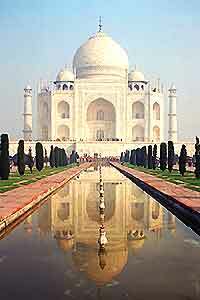 More information about Agra Tourist Attractions. Apart from the Taj Mahal itself, Agra is blessed with an array of spectacular landmarks, including some of India's finest, such as the Persian-style Chini Ka Rauza and the elaborate Soami Bagh Samadh mausoleum. Famous throughout India is the red-sandstone Agra Fort, which is simply enormous and located on the banks of the winding Yamuna River, dating back to 1565. Affording great photo opportunities, the Itmad-Ud-Daulah's Tomb is often referred to as the 'Baby Taj Mahal', since it bears a striking resemblance to the Taj, only on a much smaller scale. More information about Agra Landmarks. Agra may be almost busting at the seams with historic monuments, but only contains a handful of museums and similar cultural attractions. The Taj Mahal Museum is part of the overall Taj complex and offers information about the construction of this mausoleum, and also contains many precious gems and treasures. Part of Agra's university campus, the Spiritual Museum features a series of art works and many religious exhibits. 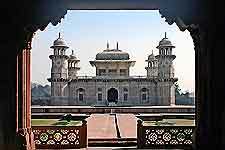 More information about Agra Museums and Art Galleries. For something a little different to grand white-marble monuments, many tourists choose to leave the environs of Agra and explore the surrounding towns and cities. Lovers of wildlife should pay a visit to both the nearby Keoladeo Ghana National Park and Chambal Safari Lodge, while for something a little more animated, New Delhi lies to the north-east and is brimming with excitement, life and energy. The vibrant city of Jaipur is also close to Agra and contains many outstanding historic monuments, such as the Amber Fort and the Jal Mahal. 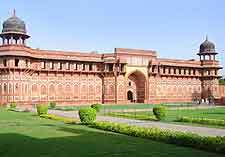 More information about Agra Attractions Nearby.